On 6th September 1862 a symbolic act was carried out in a town in Maryland that, much hyped, led to a famous poem. The Confederate Army of Northern Virginia, led by General Robert E Lee, had had a notable victory at the second Battle of Bull Run. Lee had a notion that, if he took his army on a sweep through Maryland and on into Pennsylvania, he would bring many local people on to his side. He believed that the people of Maryland, which was a Union state, were secret admirers of the Confederacy who would support his army with generous donations from the harvest they were now gathering, and their men of fighting age would rally to his cause. The incident in Frederick, Maryland, was proof that Lee had miscalculated. It was not much, in that Mrs Quantrill and her daughter simply stood outside their house and waved a union flag at the troops as they marched past, but it was a demonstration that the support Lee had counted on did not exist. Instead of farmers showering the army with gifts of freshly harvested corn, they left the fields unharvested and drove their cattle to safety so that Lee’s men could not seize them. There was no hospitality from the locals for the Army of Northern Virginia, which actually lost some 15,000 men (out of an original 55,000) due to desertion as they marched through Maryland. However, a good poet cannot let a story get away if there is patriotic sentiment to be wrung out of it. John Greenleaf Whittier (1807-92) transferred the actions of Mrs Quantrill into those of 95-year-old Barbara Frietchie who, according the Whittier, brandished the flag with the words: “Shoot if you must this old grey head, but spare your country’s flag”. Whittier’s poem “Barbara Frietchie” was written in 1864 and became an instant hit. Although Whittier did somewhat twist the facts to suit his cause – there was a real Barbara Frietchie but her house was on a different street to that which the troops marched down – it was the symbolism of the gesture that mattered and which caught the public’s imagination. As it happened, Lee’s bedraggled and weakened army never made it out of Maryland and into Pennsylvania. 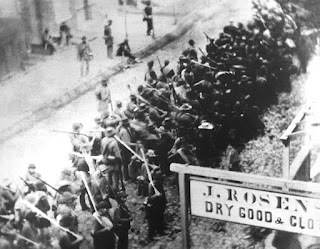 They were halted by a much larger Union force at Sharpsburg and forced to retire to Virginia.